I’m sure you all know how much I love Elemis as a brand, which leads me on to today’s post. I started using Elemis products on my skin a year this January, and I haven’t looked back since. I was also lucky to get my perfect job working at a luxury Elemis Spa in March last year, which has given such valuable knowledge about the brand, as well as training that has made me really understand to brand and products I work with each day. Elemis was founded in the UK in 1989, and has grown into the most successful spa, skin, anti ageing and body care range available in the world. Elemis do not test on animals, but instead tests on humans. I think this is amazing, as it really shows that Elemis are not afraid to spend money on clinical trials to ensure that their products are completely cruelty free. A lot of brands use animal testing, as it is much cheaper than running clinical trials on humans. Elemis products are also free of the following nasties, animal derived collagen, synthetics, mineral oil, alcohol and silicone's. Overall, working with and for Elemis has been one of the best experiences I have had, And I’m very proud to be part of their new journey commencing in 2014. I hope you enjoy today’s post lovelies, as I will be summarising my favourite Elemis products that I have personally used. If you use any Elemis products, or would like to share your Elemis wishlist then please don’t be afraid to leave your messages and links in the comments section below (each comment also counts as an entry to the giveaway), plus you can always tweet me at my direct account, which you can access just on the right hand side of my blog page :) - PS the below isn't in order of my favourites, but just cleansers, toners etc. A gorgeous scented milk cleanser that is great for balancing the skin and can be used as a daily cleanser. A luxurious Cream Cleanser that uses an array of skin protecting ingredients to keep the skin moisturised, but also balanced. A Sumptuous cleansing balm that offers a super cleansing experience with luxurious oils produced in the UK. A beautifully scented toner that helps to balance the natural ph of the skin after cleansing, as well as being a lovely mid day booster spray. A best seller from Elemis that delivers clinically proven results of improved wrinkle depth, hydration and moisture levels. A rinse off exfoliating cream that uses fruit enzymes to smooth and repair the skins appearance. A powerful oil absorbing and healing mask that is perfect for combination skin. The Lavender scent is also very natural and soothing, which makes this a great relaxation mask. A rejuvenating moisture hit which uses strawberry and kiwi to rejuvenate and boost the skins appearance. A smoothing night Cream that stimulates cell renewal, as well as helping to reduce imperfections. An indulgent 3 in 1 nourishing oil with the beautiful fragrance of Frangipani. It seems like I haven't done a giveaway in ages! 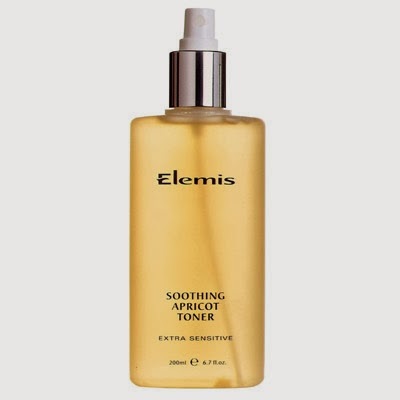 And seeing as it's the New Year I wanted to give one of my lovely followers the chance to win my most loved skincare product "The Elemis Soothing Apricot Toner" - I honestly can't sing this products praises enough, and after tweeting about it so many times.. I knew that some of my followers were keen to give it a try, so you never know it might be you! It's super easy to enter, and the main rule is that you must be a GFC/Bloglovin follower for your entry to be valid. The giveaway is international, so good luck beauties! Disclaimer - This post is not sponsored, and the prize is funded by myself. I would love to win as I could do with a bit of a pampering. I would love to win because I've never tried Elemis products and I love to try new products!! I love Elemis products so would love to win to try this one! I'd like to win because I would love to try an Elemis product. My Elemis toner is about to run out!! I love Elemis products (especially their Papaya Enzyme Peel) and know how amazing they are, but I've never tried one of their Toners before and would love to find out if it was of the same high standard as their Enzyme Peel I use. I would like to win, as my skin is really playing up in this cold weather! Plus Elemis is a great brand. I'd love to win as I've only recently been introduced to the brand and would love to try something else from them :) Lovely giveaway! Amy| The Little Koala Blog ♥ HUGE Giveaway Now on! I've heard so much about Elemis and this toner - everyone loves it and I'm excited to try it! I've never used the elemis products and I want to try! Because i never tried Elemis ! Love your posts ! It's great to hear from you and lots of products from Elemis those are great. Hope I win that one ! I've seen Elemis used when in spas but not tried them at home. I would love to do so. Have never tried Elemis but have problems with my skin and it has been highly recommended to me! I want to win as you have made it sound so good, I need a toner that is kind on my skin and this sounds effective and mild. I'd love to try Elemis as I've never tried their products before. They sound lovely. I'd love to win because it would be nice to try some quality products - all my money goes on study and children lol! I'd love to win because I'm very good at cleansing, exfoliating and moisturising but I rarely buy toner! I've been very slack with skin care of late & really need these! I've never tried Elemis brand products. But I would love to try it. So I want to win this giveaway. In this new year i want to this new brand..I have never tried this..but most of my friends told me about Elemis brand .so i wanna try this new one.....Hope i would love this in future,,,. I love Elemis. It's like having a little bit of luxury. i could never afford to buy myself any elemis products so this would be an amazing, real pampering, treat for me. I'd love to try out any of the products above! :) The moisturiser sounds lovely. Because i never tried Elemis!!! I love Elemis but haven't tried this yet, it looks gorgeous! I've never got to try any of their products and i'm on a new years budget so this would be a real treat! Would love to win! I would love to win because I have heard such great things about Elemis, and I want to try the brand out for myself. I adore Elemis and my favourite products have to be skin products. I love trying new skincare routines and trying out new products! Hi! Thanks for the giveaway! I'd love to win it because I've never tried anything from Elemis and I think this would be a good way to try it. I adore Elemis, but they are a rare treat when I can afford it. So would love to try this. i would love to win as i cant afford things like this and pamepering would be great !! The weather has battered my skin, so this would be wonderful!!!! my skin is in a shocking state. I could do with a nice pampering present in this horrible weather... I'm flagging and the smile is slipping!!! As I'd love to pamper myself!! i dont use a toner at the moment but I really should start! As I've loved every other Elemis product I've tried, although I haven't yet tried this one. I love Elemis and could really use the hydration! I would love to win as I really need some pampering at the moment. My skin could do with a treat. Elemis is such a great brand. ive never actually used elemis before which is why i would love to win and try it out especially as my face is so dry from the cold weather. FAB competition!! I adore Elemis products, but can't often afford them, so I would love to win this . Thank you for taking the time to comment on my blog post :) Each comment notification I get truly makes my day.